An Introduction to Chen Jia Gou - The China Taichi Guide is a Directory of Tai Chi Schools & Tai Chi Teachers in China. Chen Jia Gou is all about Chen Tai Chi. 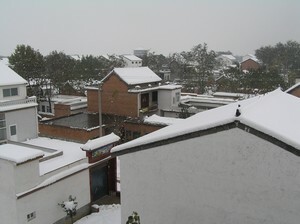 Chen Jia Gou in Henan Province, Northern China is the home of the Chen Family. Chen Style Tai Chi orginated there, and so it's an interesting place to visit and study Tai Chi. Chen Jia Gou isn't a beautiful place - you wouldn't go there for a holiday, but it's okay, and it's a good environment to do a strong Tai Chi training, which is what you need in the end. 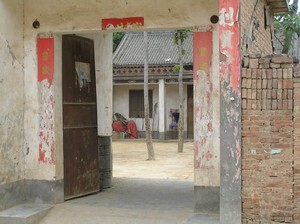 The centre of the village has two large gateways on either end, and this is the main aesthetic aspect to it. The village is made up of houses from several eras. The old courtyard houses from far into the past are quite delightful in some ways. Mysterious doorways, reveal hidden worlds behind them and its really interesting to wander round. The Communist era area still seems to have retained the feel of that time, with simple uniform houses and painted information on the corners of streets. It could be used as a film set without any changes. There are also newer houses being built and a new school, so the village is alive and growing. 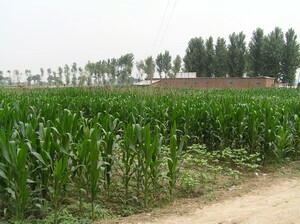 The surrounding countryside is made up of flat, agricultural land, with fields growing cereal crops. Market day is when the village seems most alive and there are people everywhere then, but otherwise it's pretty quiet. This is a place where you make you own entertainment. There is a coffee shop there now though where taichi students from the various schools can meet up and socialize. The reason for coming here is really simple, the Tai Chi. If you were to compare Tai Chi to Christianity, then this would be the Jerusalem and more importantly it still contains Olympic Gold level Tai Chi, or higher. 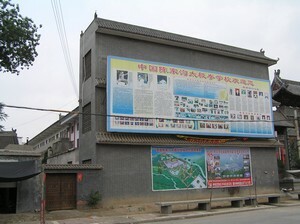 The centre of the village contains a small temple for the ancestors of the Chen family and a museum is currently under construction behind it to provide more information on Tai Chi and its origins. 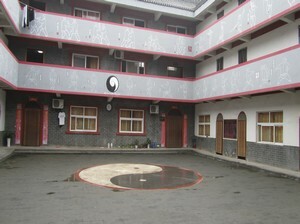 Next door is Chen Xiao Xing's huge school, where he and his son Chen Zi Qiang teach. Chen Xiao Xing is the younger brother of Chen Xiao Wang and many of the most famous 20th Generation Chen Tai Chi practitioners have passed through this school at one time or another. Hundreds of local students go through a Tai Chi education here often lasting many years. The school takes foreigners each year for shorter periods as well, who will still stay anywhere from one month to a year. Down a side road is Chen Zhao Sen's school, a small friendly place, also providing a Tai Chi education to 20 or so locals and providing World class Tai Chi training for foreign students. 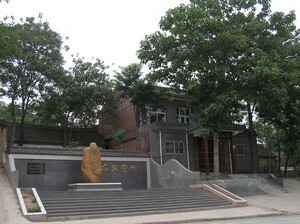 Further along the main road is Zhu Tiancai's house almost opposite the old house of Yang Lu Chan, the creator of Yang Style Tai Chi. 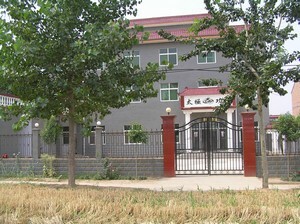 And on the edge of the village is Chen Bing's brand new school. The difficult thing in Chen Jia Gou is deciding where to learn, when everyone is so good! In addition to this there are impressive looking gateways all over the place, with Chinese characters announcing the occupants, often famous teachers of the Chen family. There is lots to explore and open up here still. I met the old Xiao Jia Master of Chen Jia Gou one day - Chen Zhi Jing and he was really happy to show me some of his Chen and internal movement. 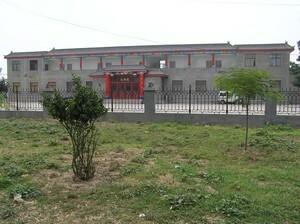 Finally, just outside the village is Wan Xi An's school, mainly training young Chinese students from the age of 8 to 18. You can visit and watch them whizz through dramatic routines of Chen Sabre or Double Sabre as if they were a children's game. There are also many shops here specialising in making Tai Chi clothing and its a great place to buy videos and dvds on Chen Style Tai Chi, at a much lower price than in the West. You have to resist the temptation to leave with bags full, as there are a lot to choose from and all seem tempting. They also stock the various 'weapons' used in Tai Chi, swords and sabres etc. and there are a few good books on theory for sale, even in English. Finally, if you want to improve your Chinese to help your communication with your Tai Chi teachers then there is also a Chinese language teacher in the village. Mei Chen is an 18th generation member of the Chen family. She grew up in Chenjiagou and has written a book on learning Chinese, so should be pretty good. You can contact her on : +86 13462888602. 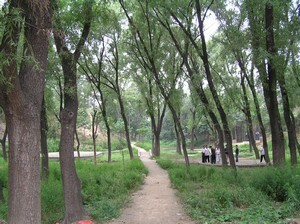 The nearby town of Wen Xian also has places that teach Chen Tai Chi although I'm not familiar with them yet. It's useful as a place where you can change money and is just a short bus ride from Chen Jia Gou. 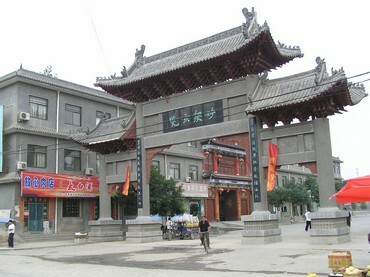 Zhengzhou is the nearest big city and you can find Chen Zhen Lei's school there. For me, the city is simply somewhere to move through, it's a great transport hub and as such is really useful. Zhengzhou is mentioned in the Lonely Planet Guidebook. 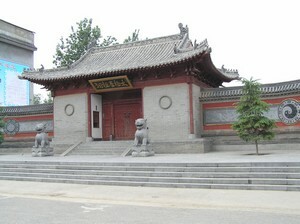 The Shaolin Temple at Dong Feng, is only a couple of hours taxi ride from Chenjiagou and so this might make an interesting side trip. Alternatively you can go by bus fron Zhengzhou. Again this is listed in the Lonely Planet and probably other guides. 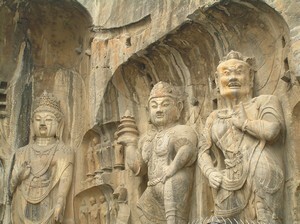 The Longmen Buddhist Grotto is also not so far from Chen Jia Gou and would make a good trip out on a day off. And there are other interesting places around as well which could provide a break from the daily routine of training. The first place to get to is Zhengzhou. As a major train hub, its easy to get here from almost anywhere. There are fast trains from Guangzhou, Beijing and Shanghai and also trains direct from Guilin. Once you arrive at the train station, walk out the front on to the square. Opposite you'll see the central bus station. 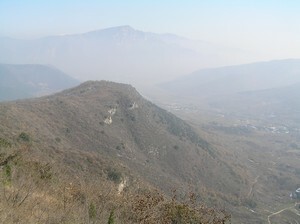 There are buses from there to Dong Feng, for the Shaolin Temple, if you want to make a trip out there first. For Chen Jia Gou, turn left and walk down the street, crossing over over a couple of roads until you see another bus station on the left. The Central Long Distance Bus Station or 'Er Ma Lu Zhan'. It's only a five minute straight walk. There are some food places nearby if you need a fast meal. 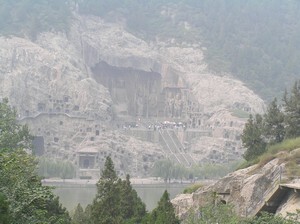 Here you can get a bus to Wenxian, and it takes about two hours. There seem to be many buses on this service. Once you get to Wenxian, you can ask around for a bus to Chen Jia Gou in the high street, but I'd recommend paying for a taxi as its not too far. It costs about 20 Yuan one way. If you've already pre-booked with a school, they may meet you here anyway if you've given them a call to say you're on the way. Most people studying Tai Chi, will stay with their teacher, either in their home or in their school accommodation, and usually this is only available if you commit to studying with them for at least a few weeks. There are two hotels here, not fantastic, but good enough for a short visit. 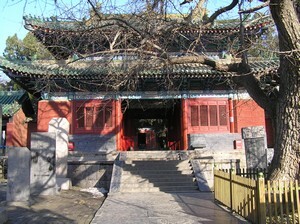 The first is just outside Chen Jia Gou, opposite the new Chen Family museum. It probably cost about 100Y a night. The second is more central to the village and hard to describe. It's probably best to ask for help. English isn't spoken here much other than by the few foreigner who turn up, and so at the moment this is a little difficult, but the people are friendly and very willing to help, if you can make the effort to try and communicate, so this shouldn't stop you training here. The climate is quite extreme. Winter is fairly cold, averaging about zero or just below in January and February, although in 2009, Winter seemed to start early and it snowed for a few days in November so beware. Spring is probably a good time to come, apparently most rain occurs in the Summer, July-September. May and June were quite dry and dusty for me in 2008 and this is true for much of Northern China, as sand and dust storms blow across from the Gobi desert. The Summer gets quite hot, averaging 28 deg. and this is when Chen Jia Gou gets most of its rain, so it is a humid time. The Autumn is when things are at its most comfortable, especially September and October, although November should be okay as well if a little cold. The main thing is to come prepared and so if you turn up in the late Autumn or Winter, than come equipped with thermal underwear, gore tex shoes etc, and a decent coat, and in the Summer bring your sun glasses and consider a room with aircon. The main thing to bear in mind, is whether you'll be able to learn Tai Chi well and get good access to the teachers. The schools have indoor areas to learn in with training mirrors on the walls, so the weather doesn't affect things too much. Summer is when Chenjiagou is busiest with Chinese students, but it should still be OK as foreigners are treated very well generally and usually get a lot of attention from the teachers. The quietest period is during the early Spring, late Autumn and Winter when if you are willing to put up with some discomfort, you can learn on a personal basis with some of the top teachers in the World and you can take this with you for the rest of your life. The China Taichi Guide : An Introduction to Chen Jia Gou. 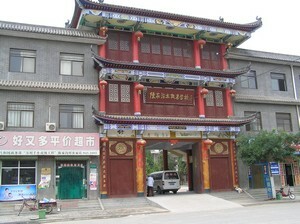 Chen Jia Gou Village is the Home of Chen Style Tai Chi Chuan and there are many good Tai Chi Schools and Teachers there to learn with. The China Tai Chi Guide is a directory of Tai Chi Schools and Teachers in China.